System integration, also simply known as SI, is the process of putting in a new system, which can still relate and communicate with the previous system or systems, be it, or they, simple or exceedingly complicated. System integration is an arduous process, which needs a lot of setting up and development, and an implementation and optimization phase. The one objective of System integration is to solve the problems that are experienced, which cannot be solved by the existing systems. 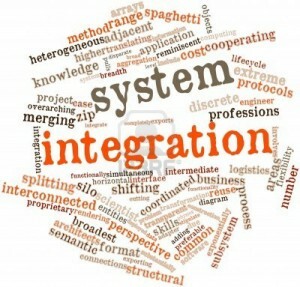 Examples of the different types of System integration are management system integration, business system integration and even software system integration. When attempting to apply software system integration, the work the current system does is first established, that is, the problems that the current system solves. When the shortcomings of the system in relation to the problem solving area are discovered, the designers of the new system must then justify how the system they wish to introduce will aid and whether it is financially viable. The new system must create profits for the organisation or at least stem losses. Management system integration brings to light new methods to reach objectives and makes use of untapped potential the previous system could not originally make use of. For example, providing wireless services to the staff that is on the field, allow for timely feedback, for example if a survey in a remote area. In this way the decision makers can make quick verdicts to the direction they should follow. This form system integration is both effective and efficient. To have your system improved as a business, all you have to do is submit a proposal to a system integration firm, who will conduct research that will aid them in the system integration process. Usually, after dissecting the existing system, they may conduct surveys into the problems those who come into contact with the system face. This is because there maybe underlying problems that even the system owners may not know exist. Furthermore, newer methods can be brought to the attention of the business, especially for those organizations that do not fund a research on new technological advancements. The survey will be the source of information for the direction the new system should take. Without the survey, the organization will be forced to perform new system integration processes every other time. Since the system integration process is tedious, it should be performed only when needed, and at the earliest convenience of the organization. System integration will always have huge potential as a business, and any firm will never have a shortage of projects to work on. With the advancements in science, technology and even business and economic models, new, faster and sharper methods will always be devised to produce the same result. And so instead of re-inventing the wheel, producing an entire new system, which is quite costly, one can just tweak the older system to accept the new requirements. In this way a lot of capital can be saved.